Larry Dulay Itliong (25 October 1913 – 8 February 1977), also known as “Seven Fingers“, was a Filipino American labor organizer. He organized West Coast agricultural workers starting in the 1930s, and rose to national prominence in 1965, when he, Philip Vera Cruz, Benjamin Gines and Pete Velasco, walked off the farms of area table-grape growers, demanding wages equal to the federal minimum wage, that became known as the Delano grape strike. He has been described as “one of the fathers of the West Coast labor movement. The first public art memorial honoring Filipino American farmworkers was unveiled on June 24, 1995 in LA`s Historic Filipinotown with Larry Itliong and Philip Vera Cruz as its most prominent historical figures. Itliong was posthumously honored in 2010 by inclusion in a mural at California State University, Dominguez Hills. 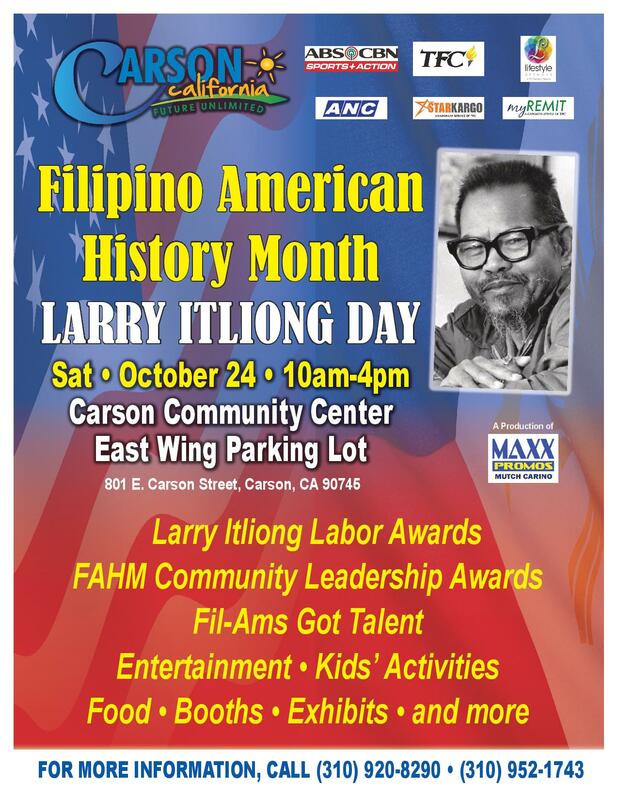 In 2011,Los Angeles County recognized Itliong with Larry Itliong Day on 25 October; this follows the City of Carson which became the first city in the United States to recognize Larry Itliong Day in the United States in 2010. In mid-April 2013, the New Haven Unified School District renamed Alvarado Middle School Itliong-Vera Cruz Middle School in honor of Vera Cruz and Larry Itliong; this school is the first school in the United States to be named for Filipino Americans. There was a vocal opposition to the name change, some of whom waved Mexican flags, who said that the name changing disrupts the neighborhood’s tradition. The middle school was originally named for Juan Bautista Alvarado, and the name change will not take effect until 2015. This occurred after a 13-year effort to rename a school for the Filipino American leaders, after several other schools had been named to reflect the city’s diverse population, including Cesar Chavez Middle School, where 20% of the population is Filipino American. In late April 2013, a Filipino business and a Filipino Community Center were targeted with graffiti vandalism; the graffiti was investigated as a hate crime. In 2014, an overpass over the Filipino American Highway was designated as the “Itliong-Vera Cruz Memorial Bridge”. Itliong will be portrayed by Darion Basco in the 2014 film about Cesar Chavez; the film will not include other Filipino American farm labor leaders such as Vera Cruz. A documentary titled The Delano Manongs: Forgotten Heroes of the UFW was made to highlight the role of Filipinos in the farm labor movement, including Itliong; the documentary was released in 2013. Next City of Carson Red Ribbon Week is ON!